If you land in a Disputes Tribunal in Wellington you may be assigned a adjudicator such as Phillipa Ballard. If you are unlucky, like me, you may end up with an adjudicator who violates your rights by distributing your private legal documentation. You may also land with an adjudicator who states that it is not the role of the Disputes Tribunal to achieve justice. You may also land with an adjudicator who allows patently obvious falsehoods into the hearing. You may also land with an adjudicator who claims she does not have time to look at the facts. Good luck if you then request a rehearing based on the fact that you have not had a fair hearing. Guess who will judge your rehearing application? My rehearing application was considered by the same adjudicator, Phillipa Ballard. She then decided that her own hearing was competently done. Facts are facts, so we could easily prove the adjudication was unfair with access to the records. So I tried to get access to the hearing records so I can prove my case and get a rehearing. Court records can be requested through an “Application for access to court documents”. If you do so, Christopher Bell will then tell you that Disputes Tribunal Hearings records are not accessible under Access to Court Documents Rules 2017. I can’t speak to how the recordings may or may not affect your position. I can’t speak for the Referee and so can’t give you the reason for the decline. So it is not possible to get access to evidence from the hearing. It is possible to make a section 13 complaint about a Judge through the Judicial Conduct Panel Act 2004 (the Act). They will even help you with your submission. On filing a section 13 complaint I was told the Disputes Tribunal is exempt from this Act. The Ministry of Justice is not able to intervene in the way a referee conducts a hearing or help you prepare your submissions. So Disputes Tribunal adjudicators have more protection against scrutiny than judges! You need to take your case to District Court, but the Tribunal decides whether you are allowed to take your case to the District Court. So if a pack of fools gets established in a Disputes Tribunal there is no way to address their competence. They cannot be scrutinized, as their records are not accessible and nothing will be made transparent. They also judge their own competence and attempts at independent review are resisted. So if you want justice – Run, Baby, Run – and avoid the Wellington Disputes Tribunal like the plague. p always felt shunned as he was an odd prime. One day an important mathematician was working on a difficult problem, and he really struggled to solve it. From then on mathematicians considered odd primes to be normal primes. And p lived happily ever after. Capitalists are measured by the sum of their capital. Materialists are measured by the sum of their material. Communists are measured by the sum of their communion. Humanists are measured by the sum of their humanity. An economy is an infrastructure for growth similar to a garden. Economies need regulation (tending) just like a garden does. Whilst establishing a civilisation we humans have made a choice to order our environment. So its is contradictory that some people advocate an unregulated economy. A self-regulatory (untended) garden (economy) will let unwanted plants prosper. Weeds will take over and the most useful plants and fruits die out in untended gardens. The flipside is also true. A good gardener (economist) will not be heavy handed on pesticides. The garden ecosystem require spontaneous interaction between organisms. “Market forces” is just another name for greed that must be constrained in a civilised society. The garden is used as a comic metaphor in Being There. The terms “Capitalism” and “Socialism” introduce ideological prejudices into viewpoints on money and equity . One of the things that is bothering me is obscene salaries. Some CEO’s earn more in a day than many people earn in a year. We can resolve this by legislating that organisations may not pay anybody ten times more than any wage in their organisation. So a CEO can earn no more than ten times the minimum wage paid by their organisation. This may also be the most effective way to lift wages above the minimum wage. Bees are industrious, organised and intelligent. Instead of explaining this in an article, I submit the following photo to the reader. See how those bees are watching me whilst I was checking out their health by opening their hive. Like other Fauna and Flora, bees have been domesticated. The environment of domestic bees were changed by the introduction of artificial hives. 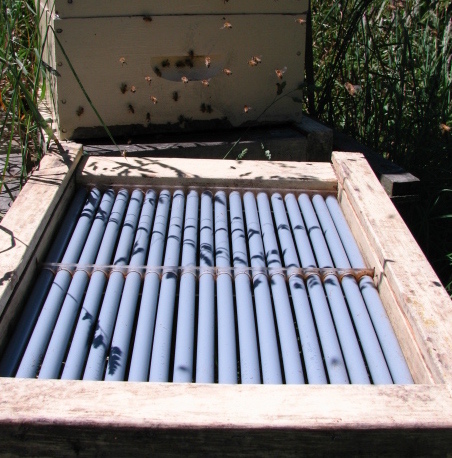 Most honey bees are managed in in boxes where they store their honey in rectangular combs that are easily harvested. Feral colonies (bee colonies their native habitat) are not the norm. Whilst a lot of feral bees have been decimated by pests like the Varroa mite, feral colonies have proven to be more resistant to pests than domesticated bees. Man-made beehives normally adopt the Langstroth design. 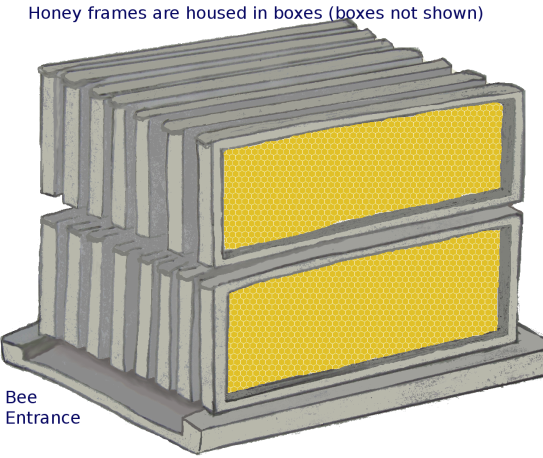 Bees store their honey and babies in frames. About nine of these frames are placed in boxes. A number of these boxes are stacked on a “bottom board”. Bees normally land on the bottom board and walk into the hive entrance at the bottom. At the end of spring, bee keepers empty about half the honey out of each hive. Some commercial bee-keepers can be mercenary about the amount of honey they harvest. To ensure that bees make it through winter, bee-keepers feed the bees sugar water or an equivalent. This is like raiding the fruit and veggies and replacing it McDonalds food. Varroa mites are like big ticks. If you were the size of a bee, a Varroa mite l;arger than a rat would be sucking your blood. A bee with more than one Varroa mite does not last long. Most bee-keepers use insecticides to control the amount of Varroa. 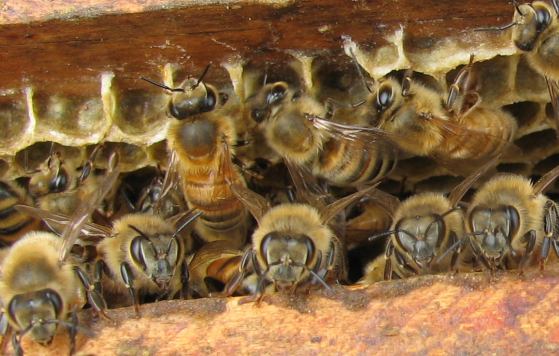 Bees will clean out their hives by removing dead bees, waste, the odd Varroa mite and other debris from the combs. As bottom boards are flat, the debris normally accumulate there. The beehive entry point therefore become the accumulation point of the hive debris. Live mites often end up on the bottom board with the debris, where they can re-attach themselves to bees that walk in and out of the hive. Some bee colonies spend more effort on hive hygiene by cleaning out their hives. It is well known that bees that are hygienic are more resistant to Varroa mite and pests. Many scientist say there is no single cause to “colony collapse disorder”. “Colony collapse disorder” seems to be related to infections and Varroa. The hive can be seen as an ecosystem that include bees and bee pests. The introduction of the artificial hive has changed this ecosystem, allowing pests to evolve their behavior to gain a competitive advantage. 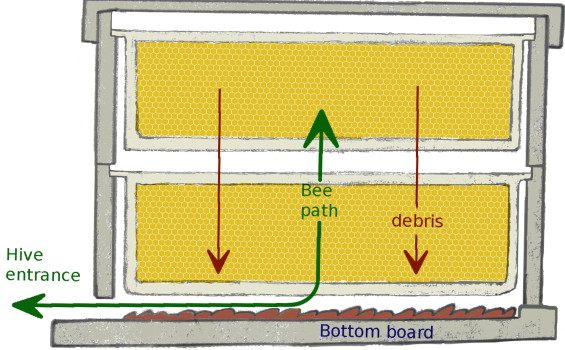 One method to improve the hygiene design of bee boxes, is to install a bottom board that allow debris (including live Varroa mites) to fall through onto the ground. I have made such a bottom board,- as shown in the picture.